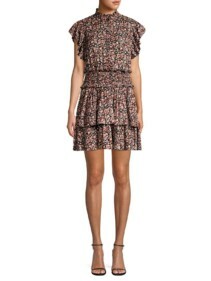 If you’re a lover of expertly crafted prints these Rebecca Taylor dresses will undoubtedly steal your heart. The beautifully named, Vivianna vine silk burnout dress artfully combines subtle Victorian features with a modern, mini hemline. 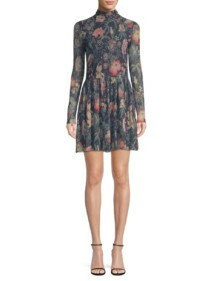 We simply adore the smocked neckline, voluminous sleeves and supremely delicate floral print. Style this dress with heeled sandals and softly tousled curls to complete your look. Should you desire a midi length option, opt for the champagne hidden leopard dress. This fabulous midi observes the animal print trend and offers us a new take with this incredible print. As with the majority of Rebecca Taylor creations, this dress can be effortlessly adapted to your needs. It’s completely ideal for a summer getaway of course but can also be layered over a sweater and worn with boots in winter. The flattering smocked bodice and tie straps alone are reason enough to covet this dress. For pieces that will have you feeling fabulous time after time, look no further than these Rebekah Taylor dresses. The Tissue denim blue dress is as versatile as it is beautiful. Every girl needs a denim dress in their wardrobe and this 100% cotton take certainly gets our vote. The playful deep v-neckline works perfectly with the sweet ruffled hem and cutout back. The back also ties into a large bow which furthers the charm of this adorable mini dress. Additionally, the defined waist flatters the figure and combined with volume from the skirt creates a wonderfully feminine silhouette. This dress is ideal for planned trips abroad this winter. It doesn’t get more perfect than the hammered silk black v-neck dress when it comes to wardrobe staples. 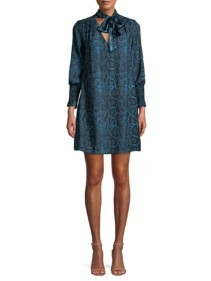 This stunning silk mini can be dressed up or down and is incredibly flattering to the figure. The classic v-neckline and ruffled sleeves are wonderfully elegant whilst the self-tie belt and shirred detailing defines the waist beautifully.